In my senior photo I had to wear a tux! For $10, I bought Ghost Rider 2099 #1 to issue #10. I was sold on the pack when I found out that the early issues of Ghost Rider 2099 feature the early art of Chris Bachalo. I had recently gone back and looked at some old Kev Walker Marvel art and was very interested to see a top artist's work back when it was a bit more raw. With Ghost Rider 2099 #1, you are getting the glimpses into a yet to be perfected style which is definitively Chris Bachalo. The pencils are very rough and have been drowned a bit in pools of ink and excess ink-dust (slight flecks of ink all over the panel); however, there are a few intense elaborate panels which have become some what of a Bachalo signature. His Ghost Rider 2099 appears to be a mix of what the standard Ghost Rider looks like along with a biker-gear clad Terminator robot. Like if the Terminator didn't have a fake human skin, yet still wore a black leather jacket. Oh, and his head was constantly on fire. Bachalo's cover is very menacing. 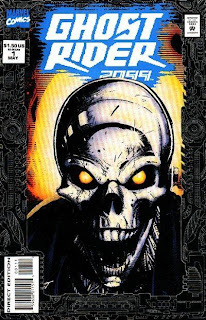 The skull-like robotic head of Ghost Rider 2099 has an evil smirk which sets the tone for the character's attitude. Ghost Rider 2099 #1 is of course set in the future 2099 universe Marvel dabbled in in the early 90's. Rather than being the incarnation of a demon of vengeance, in the comic of the day he is revealed to be a Ghost Rider for a conscious cyber-stream of data which is created to protect man-kind from itself and from accidentally wiping out all the data man-kind have collected. He's like a demon created by the internet itself. Like Mark Zuckerberg or Rebecca Black. Zing! In all seriousness, Rebecca Black is actually pretty amazing in the sense that her name now comes up on Google just by typing the letter "R" in the search field. Joke as everyone will, her music is in your head setting it ablaze with both hate and vengeance. Remind you of anyone?